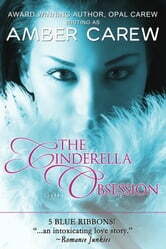 Can Vanessa risk falling in love with a man obsessed with a fantasy woman -- even though that woman is her? Vanessa always wanted to be Cinderella. Taking the opportunity to attend a lavish masquerade ball -- even if she wasn't invited --was just too delightful an opportunity to resist. When Nicholas Powers dragged her into his arms for the most explosive kiss she ever experienced, she floated on cloud nine. It is a fantasy night she'll never forget, even though she knows she would never have a chance with him. Especially when she winds up working for him as a temp and sees him obsessing about finding his Cinderella... a fantasy she can never fulfill. Nick had never felt such fiery passion as he did when he held the dazzling beauty in his arms. She aroused him as no other woman could, then she ran away with his heart, leaving behind only an antique glass slipper earring. If only the mask hadn’t hidden her features. Knowing no other woman could ever make him feel the way she did, he swears to find her and make her his. Why, then, does his little spark of a secretary make his pulse quicken? Previously published as "Masquerade of Love". Plus excerpts of His To Command and The Office Slave by Opal Carew.